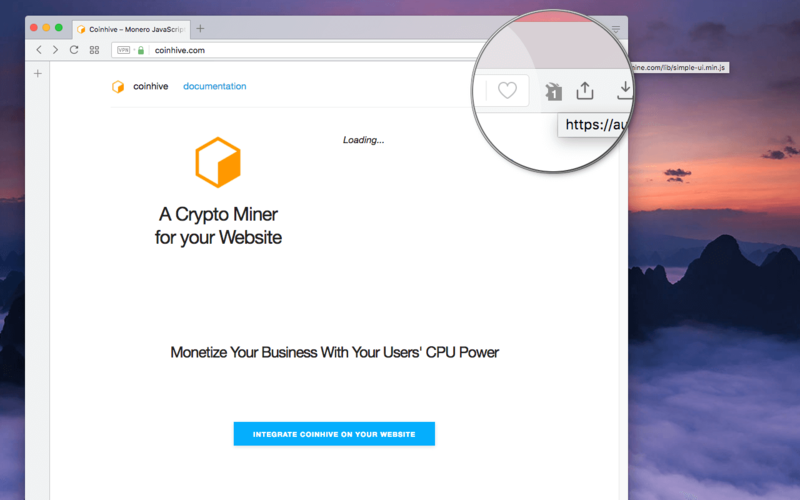 "Coin Mining Blocker" is an optimized host blocker extension that is adapted to block third-party JS scripts which do digital coin mining during your visit on some websites. The extension displays the total number of blocked scripts in the badge area. It is possible to disable or enable the blocking module by pressing the toolbar button. This extension updates its filtering rules on every browser restart or after 24 hours of the last update. What is "Coin Mining Blocker" extension and how does it work? This extension adds a toolbar button to your browser after installation. When it is active (default behavior), a new network observer is installed which blocks two type of resources ("Script" and "XMLHttpRequest") if the resource hostname matches with the known list of digital coin mining scripts. Since the companies behind these mining scripts are constantly updating their hostname addresses by creating new servers (to bypass adblocker extensions), "Coin Mining Blocker" add-on updates its filtering rules from two different projects. If a new rule is detected, it will get appended to the current list. If you have spotted a new miner script that is not yet supported, please open a bug report or request a pull merge. The badge displays the total number of blocked scripts that could potentially be used for digital coin mining. To see the actual URLs of these mining scripts hover your mouse over the toolbar button. Do I need to update the database manually? No, there is no need to update the filtering rules. When a new rule is appended, the extension will automatically update its database. What is the difference between this coin miner and other similar extensions? I created this one since no other coin mining blockers were blocking all the known miner scripts. This one uses filtering rules from "NoCoin" project; however, there is an additional list that I maintain myself. Whenever I find a new mining script or an old one that is hosted on a new server, I'll update the list. Can I disable the script blocking for a while? Yes, just press the toolbar button once. The current status of blocking is displayed in the tooltip of the toolbar button. Note that this extension uninstalls its observer when the extension is not monitoring the network, and hence it uses no resource at all while the observer is disabled.